Harsh Mariwala has spent the better part of his life building Parachute into the world’s largest selling coconut oil, becoming a billionaire in the process. But now the 65-year-old chairman of Marico, a Rs6,132-crore-a-year fast-moving consumer goods (FMCG) company, is steering his twenty-five-year-old firm into an age of disruption. From a time when mom-and-pop stores were the mainstay of the retail industry, shoppers are now logging online and upstart yoga gurus are re-writing the rules of Indian household consumption. India’s younger urban shoppers are also ditching long-held notions of beauty and fitness to spend on better brands and an aspirational lifestyle. Meanwhile, in rural India, the low penetration of branded goods means the hinterland remains a goldmine. Mariwala, a commerce graduate from Mumbai’s Sydenham College, is a suave and well-spoken man, most often found in a sharp business suit, much like peers in the industry. And somewhat like his established contemporaries in India’s FMCG sector, Marico’s chairman, too, is surprised by the rise of an unlikely competitor: Ramdev, a 50-year-old saffron robe-clad yoga guru. The stupendous success of Ramdev’s Patanjali Ayurved—beginning operations in 2006 in the northern Indian city of Haridwar, it now sells everything from soaps to honey—at a time when FMCG companies are battling tepid demand, has stumped even an industry veteran like Mariwala. “I think they are leveraging on two or three things,” Mariwala said in an interview in New Delhi. The first, according to him, is the speed at which Patanjali has launched new products and expanded its portfolio of products. Patanjali today sells over 400 stock keeping units or SKUs. “No other FMCG company would dare to launch so many products in such a short period of time,” Mariwala said. The strategy seems to have paid off. From Rs446 crore in 2011-12, Patanjali’s revenue rose to Rs2,006 crore in 2015. In just the one year ending March 31 2016, it has more than doubled its revenue to Rs5,000 crore for the year ending March 31, 2016. But Patanjali’s rise has apparently had little impact on Marico’s brands. “They have, to some extent, eaten into certain categories of FMCG companies but have not had that much impact on our business,” Mariwala insisted. For instance, in categories such as oral care, where Patanjali sells toothpaste under the Dant Kanti brand, the company has cornered a market share of 4.5% in 2015, according to a January 2016 report by brokerage firm Kotak Institutional Equities. However, a limited part of Marico’s portfolio, comprising oils, serums, hair gels, cooking oil, and oats, competes with that of Patanjali’s. For Mariwala’s Marico, and the FMCG sector at large, there are bigger issues to worry about than Patanjali’s rapid rise. Growth in India’s $49 billion (Rs32,598 crore) FMCG market dropped to a decadal low in 2015 as shoppers across urban and rural India spent less on food, home goods, and personal care products. Battered by two consecutive years of low rainfall and dampened farm output, rural consumers, in particular, tightened their purse strings. In the April-June quarter of 2016, for instance, the growth of the overall FMCG market slowed down by one percentage point, according to data released by research agency IMRB. Volume growth in urban and rural markets was down to 3% and 9%, respectively. A year ago, those numbers stood at 4% and 10%. The Narendra Modi government, which came to power in 2014 promising to spur economic growth, has also been a bit of a letdown. “Over the last two years, post the new government coming in, there were very high expectations. People expected things to change in a very short period of time… that has had its impact on players,” Mariwala explained. “Growth is there, but the pace is not what we had expected,” added Mariwala. ”This is the lowest (demand) we have seen in say five to seven years,” he said. For the year ended March 31, 2016, Marico’s consolidated revenue from operations stood at Rs 6,132 crore (pdf) up 7% from Rs5,733 crore in the previous year. But Mariwala remains cautiously optimistic. “…There is always the hope that things will improve. In the near future, the hope will be reinforced partly because of the monsoons and partly because of the disbursal of the 7th pay commission. And then there are newer reforms like the Goods and Services Tax (GST),” he said. “A lot of groundwork is being done to spur demand. 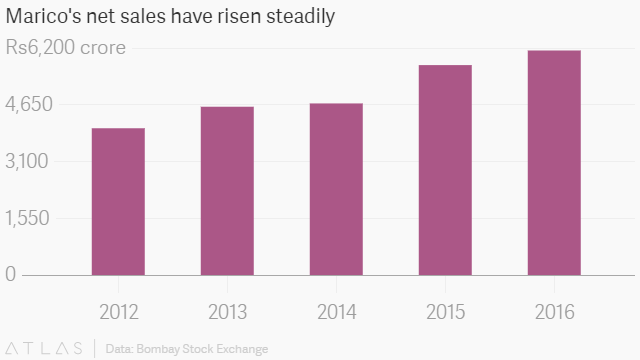 Then, there’s the rise of e-commerce, which is changing the retail market. And to understand that phenomenon better, Mariwala appears open to delegating to younger colleagues who have a better sense of the target demography. Meanwhile, Mariwala is looking ahead, watching how urban and rural consumers are rapidly changing their consumption patterns. In the rural market, which constitutes between 30% and 40% of sales in the FMCG sector, Mariwala wants to grow the reach of his products. By 2025, rural India’s FMCG sector alone is expected to reach $100 billion (Rs66,527.5 crore), according to estimates by Nielsen, which means Mariwala has massive room for growth.